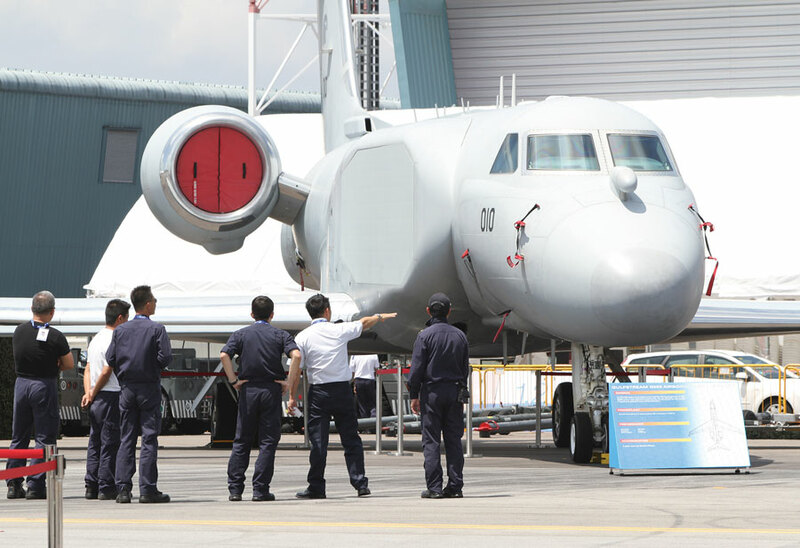 Israel’s aerospace industry is a major supplier of equipment to the Singapore air force, as evidenced by Israel Aerospace Industries’ G550 Conformal AEW aircraft on display here. Photo by David McIntosh. General Avieli highlighted the ability of Israeli industry to rapidly develop tailored solutions to suit any customer. “The close connection between the IDF [Israel Defense Force] and the industry creates a situation whereby the development, and the response to needs, is one of the fastest in the world,” he commented. As well as the household names of Elbit, IAI, IMI and Rafael, the Israeli Pavilion includes participation by Aeromaoz, Hydromechanical Engineering (HEC), Kanfit, MTC Industries and Research, and Plasan. Aeromaoz is exhibiting a wide range of its human machine interface applications, which include display panels, control systems, joystick and handgrip elements, and various internal and external lighting solutions. HEC specializes in both test equipment for military and aviation applications, and ground support equipment. Examples of the latter include hydraulic launchers for UAVs, towing carts and fueling vehicles. Plasan designs, develops and manufactures ballistic armor protection and survivability systems. It provides a customized service for a wide range of air, sea and land vehicles. Here at the airshow it is showing off its armor solutions for tactical helicopters such as the Sikorsky Black Hawk, Boeing Chinook, Eurocopter Super Puma and Mil Mi-17. Plasan also offers armor solutions for Lockheed C-130 Hercules transports. MTC Industries and Research Carmiel (Booth N51) is showing off its latest product in the Israeli Pavilion–a redundant electromechanical rotary servo actuator (ERSA). The company claims that the redundancy built into the new ERSA will significantly reduce the number of UAV flight control failures, and so reduce the number of high-value losses. The ERSA is based on duplicate flight controls located on two separate control boards. This back-up feature allows the UAV to continue flying in the event of a component failure. Another advantage of the ERSA is its use of dual DC brushless motors, which offer much-reduced maintenance requirements due to a lack of wear and tear compared with traditional brush-based motors. Control and servo actuators are just one product line in MTC’s portfolio of electromechanical products. The company also produces a range of gyros and MEMS devices, electric motors, position sensors, solenoid valves, slip rings and gimbal units. As well as its production location at Karmiel in Israel, the company operates a facility in Dallas, Texas. Exhibiting as part of the Israeli Pavilion, Kanfit (Booth N49) is showcasing its capabilities in the field of developing and manufacturing components for the aerospace industry. The company has considerable expertise in integrating composites and metal, and also using resin transfer molding (RTM). One area where the company has employed its capabilities is in the manufacture of chaff- and flare-dispenser magazines. RTM technology provides lightweight units that, through the removal of seams and welding, have no failure points. Kanfit’s technology allows the units to be highly reproducible with tight tolerances, said the company. I never attended the Singapore Air Show this year. But I would sure like to see Israel bring their F-15 and F-16 fighters to the next air show come 2014, regardless of static display or flying.